- Country information has been updated as of 10 February, 2005. - There have been some significant changes to the latest edition of The World Factbook. Recent confirmation that the United Kingdom Government administers the Sovereign Base Areas of Akrotiri and Dhekelia on Cyprus as dependencies (and not as lease areas like the US Guantanamo Bay Naval Station in Cuba) has required a changing of their status and their addition to the Factbook as new entities. In addition, the European Union has been included as an "Other" entity at the end of the listing. The European Union continues to accrue more nation-like characteristics for itself and so a separate listing was deemed appropriate. A fuller explanation may be found under the European Union Preliminary statement. - Along with the new entities and the regular information updates, The World Factbook now also features five new fields. In the Economy category, entries have been added for Current account balance, Investment (gross fixed), Public debt, and Reserves of foreign exchange and gold. The Transnational issues category has a new Refugees and internally displaced persons entry. - Revision of some individual country maps, first introduced in the 2001 edition, is continued in this edition. Several regional maps have also been updated to reflect boundary changes and place name spelling changes. 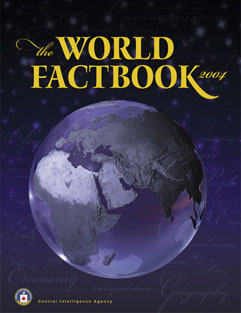 The World Factbook 2004 printed version provides a "snapshot" of the world as of 1 January, 2004. The online Factbook is updated periodically throughout the year. leadership in selected foreign countries, see Chiefs of State.